The ID Office is located on the second floor of the Student Center across from the Administration Office. Normal business hours are Monday – Friday from 8 a.m. to 4:30 p.m. Student Center building hours. Photo must be from the top of the shoulders to top of the head with blank space above the head (Driver’s license or Passport format). Look straight ahead (no profile or angle). No hats, scarves, sunglasses worn unless worn for valid religious reasons. A straight face or smile. Upload a valid (non expired) U.S. Government issued form of identification (Driver’s license, passport with U.S. Visa, State or Military issued ID. If you are unable to submit your photo online, you can get your card in person when you attend New Student Orientation or any time after. You will need to present a U.S. Government issued form of identification (Driver’s license, passport with U.S. Visa, State or Military issued ID. To receive an ID card you must be a student, staff, faculty or retired member of the university. If you are a new faculty or staff member, a picture form of identification and your contract from Human Resources must be presented prior to obtaining a card. Last, first, middle name or initial in addition to classification will be printed on the ID card. No headgear, sunglasses or any other item that obstructs the face will be worn at the time the ID picture is taken. In accordance with the United States Department of State policy regarding the wearing of religious headgear in passport photos, photographs must be taken with no visible obstruction of the face necessary for positive identification. The upper portion of the forehead to the lowest point of the chin may not be covered. Photos can be taken at the ID office. New students will incur a $10 charge, which is charged to their Bursar bill. (non expired) government issued photo ID: driver’s license, state ID, military ID or a passport must be uploaded with your photo. ID cards will be available for pick up at 8:00 am on the day of your orientation. (Monday or Friday only) will be the only card guaranteed for pick up no later than 4:00 pm on the day of your orientation. If you uploaded a photo, you will need to come to the ID office to pick-up your card during your orientation or any time after. It is required that you bring a valid (non expired) government issued photo ID such as a driver’s license, state ID, military ID or a passport. Individuals who fail to bring the required identification will not receive their SIU ID Card. The ID card cannot be picked-up by a parent, guardian or anyone other than the student. A name change on a card will be permitted if the required forms of identification are presented at the time of the request. Individual will incur a $12.50 charge to their Bursar account. 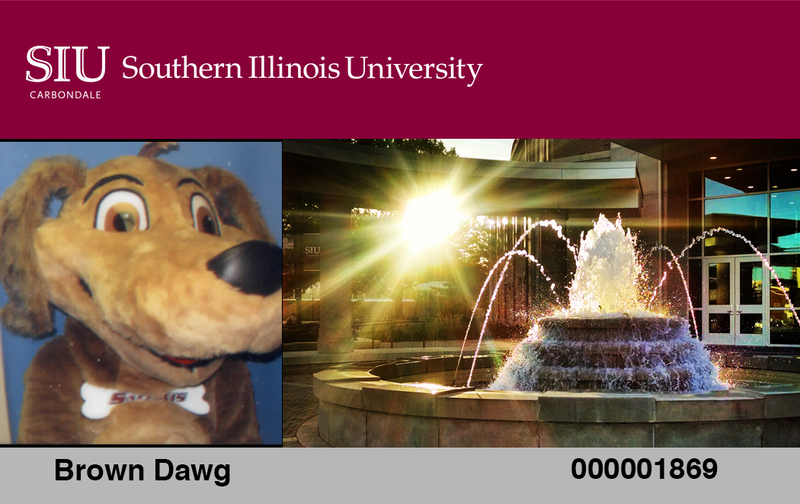 If your card has been stolen or misplaced you will need to go to SalukiNet or idcard.siu.edu to inactivate your card or call the ID Office at 618/536-3351 and let us inactivate the card for you. After 4:30 p.m. and on weekends you may notify the Department of Public Safety (618/453-3771). If you find your card you will need to bring it to the ID Office for re-activation or go to SalukiNet. We will not re-activate your card over the phone. For a replacement ID card, you will incur a $25 charge to your Bursar bill or you may pay using your Debit Dawg at the time of service. The cardholder is responsible for safeguarding their ID card. Should a card become lost, either accidentally or by theft, SIU assumes no responsibility for illegitimate purchases from the cardholders account prior to the cardholder notifying the ID office during regular business hours at 618/536-3351, deactivating the ID card through SalukiNet after business hours, or by contacting the SIU Department of Public Safety at 618/453-3771. Depending on where your card was lost, your ID may be mailed back to the ID card office. You must be a current student to claim a lost card. Students will need to contact their academic unit. The academic unit will forward your request to the ID office. ID cards are the property of the Student Center ID office. If you allow another individual to use your card for the purpose of obtaining services, such as Mass Transit or meals in the dining halls, your ID will be confiscated and the cardholder will be subject to disciplinary action. To prevent damage to our card swipe devices, cards turned into the ID office that are taped, cracked, chipped, have animal bite marks, holes, bent or damaged in any other way will be shredded. Cards with an image that is too worn to identify the cardholder will also be shredded. Patrons bringing non-working ID cards to our office that are cracked, chipped, have animal bite marks, holes, bent or worn image will not be repaired.